The two objects in this exhibition exemplify the birth of Buddhism in Japan. 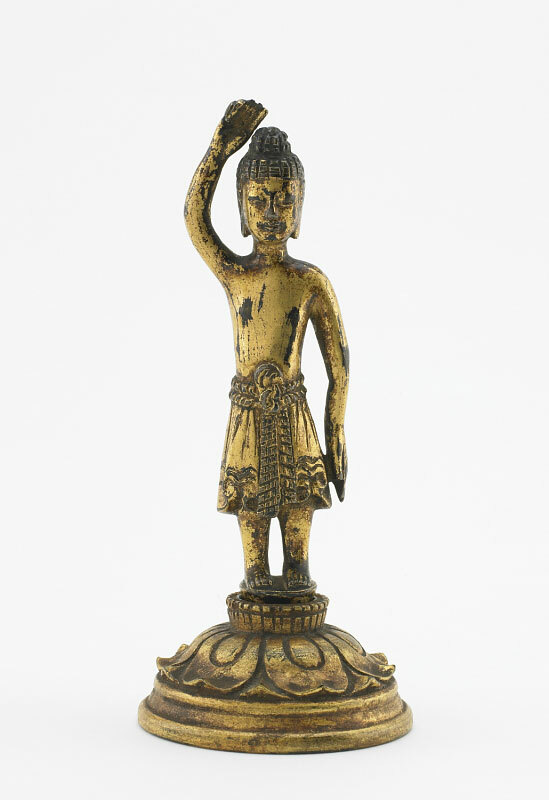 In 552, the Korean kingdom of Baekje sent the Japanese court sacred texts (sutras) and a gilt bronze sculpture, thought to be similar to the one on view. The Japanese, whose native gods did not have visible forms, were impressed by images of Buddhist deities and stories of their powers, as related in the sutras. Early adopters of Buddhism at court built temples and sponsored ceremonies, lectures, and the copying of sutras. In the mid-eighth century, Emperor Sh?mu mandated a nationwide system of official temples. He also commissioned a more than fifty-foot-tall gilt bronze sculpture of the cosmic buddha for the T?daiji temple in Nara, the imperial capital. The sutra segment in this exhibition is traditionally called ?j?mu (Great Sh?mu) in the emperor’s honor.